For more information see Con-Sert Tools. The Con-Sert HLS Concrete Screws are the standard "high-low thread" hardened steel screws designed for cutting threads into a predrilled hole in poured concrete, block and brick. The Con-Sert HLS has a sharp "gimlet" point for easy starting and piercing of most all light guage materials. 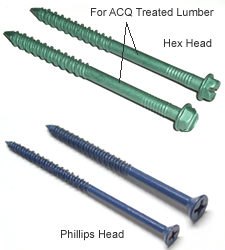 3/16 x 4" 1/4 x 1 1/4"
The Con-Sert HLS Tools are the NEW & PATENTED way to anchor all "high-low thread" concrete screws. These tools also work with all Tap-Con* type screws. The dual purpose Con-Sert HLS Tools allow you to drill the hole and drive the screw through the object being anchored and into the concrete eliminating the need to line up the hole! Extend bit into desired depth notch.